For so many animals who end up in a shelter kennel, waiting desperately for a second chance, a photograph often provides potential adopters with a first impression. Sometimes, however, if that image is unflattering, poorly framed, if the snapshot fails to capture the pet’s beauty or personality, that photograph can spell disaster for a dog or cat who needs a home. Carlos was adopted after a couple saw his photograph on the Landfill Dogs Facebook page. If, as the saying goes, the first impression is the last impression, a great picture can be the difference between life and death for a shelter pet. That’s why one professional photographer wants to ensure that the homeless pets she meets at the Wake County Animal Center in Raleigh, N.C., have a shot at making a great first impression. For the past 18 months, every week, Shannon Johnstone takes one Wake County dog out of the shelter for a make-or-break photo shoot. 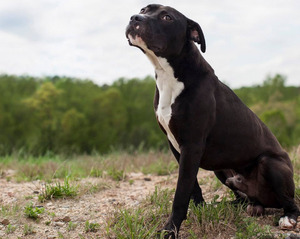 If the shoot goes well, chances are that dog stands a much better chance at getting adopted. According to Johnstone’s website, she chooses the dogs who have been at the shelter for at least two weeks, dogs who will be euthanized if they fail to find a home quickly. “I wanted to specifically focus on the ones who had been there the longest, because they’re not going to have much time left,” Johnstone tells ABC News. Johnstone calls her photography project Landfill Dogs, named both for the site where she stages her photo sessions with the dogs — a local landfill — and for what the landfill represents. “The second reason for the landfill location is because the county animal shelter falls under the same management as the landfill. This government structure reflects a societal value; homeless dogs and cats are just another waste stream,” Johnstone writes. But the photographer and animal advocate also feels that the landfill represents something else, something much more powerful: hope. Wake County Animal Center Animal Services Director Jennifer Frederico says that it’s the chance to get outside, out of their kennel and into the world that seems to ignite a spark in the hearts of the shelter dogs Johnstone photographs, and it’s that spark that makes all the difference. “They’re here sometimes for 30 days or more, they get out and they’re so joyous. They’re showcasing this energy, this optimism that they’re still waiting for that perfect person and, hopefully, that will come,” Federico says. Johnstone’s photographs are making all the difference. Potential adopters are flocking to Johnstone’s website and her popular Landfill Dogs Facebook page, looking for their next four-legged friend among Johnstone’s beautiful photographs. Johnstone can’t resist checking in often to see if her canine subjects are getting the “likes” they need to perhaps find a forever family. “I’ll wake up in the middle of the night and be like, did they get their home yet?” Johnstone says. So far, Johnstone’s beautiful photographs have helped 67 dogs at the Wake County Animal Center find forever homes. American Pit Bull Terrier mix Carlos is one of those lucky dogs. All it took was for Scott and Sherri Lynch to see Carlos’s amazing photograph on the Landfill Dogs Facebook page and it was love at first sight. If you’d like to learn more about Shannon Johnstone and the Landfill Dogs, visit and “like” their Facebook page today. Johnstone’s photography book, Landfill Dogs, is also available for purchase at Blurb.com.